Keep reading to see all of the vegan and gluten free eats I tried at all of the parks (and a few resorts). Apologies that these photos aren’t up to my usual quality–I didn’t bring my DSLR with me. Note: I didn’t verify the gluten free status of all of the food I had at quick service places that didn’t appear to have gluten ingredients. Always ask to see an allergy binder or talk to a cast member if you have an allergy or intolerance. I had a lot of fun at the princess character breakfast at Akerhus Royal Banquet Hall in Norway–my breakfast options included a vegan breakfast plate with tofu scramble, grilled veggies, and hash brows, an allergy waffle, fruit from the buffet, and coffee with soy milk. Check out my post about it for more photos and details about my experience. The dish came with baby potatoes, soy sausage crumble, baby spinach, tomatoes, peppers, and whole grain mustard vinaigrette–I love cauliflower and potatoes and it’s always cool to see vegan meat incorporated as well (especially when it’s gluten free in my case.) The server brought me vegan/gf bread and oil as well and mango sorbet with berries for dessert. Here is the allergy menu and dessert menu if you’re curious. I enjoyed the vegetable sushi at Tokyo Dining last year, so I made a reservation for my family this year as well–I got edamame and the Vegetable Sushi (no kanpyo because it has honey), and they even have gluten free soy sauce. I made the reservation at 8:30pm hoping we’d be able to watch the fireworks (which start at 9), but when we arrived they said they couldn’t seat us right by the windows because our party was too big (5 people), but we were still able to see them to some extent from further away. If you’re on the Disney Dining plan, they give you two sushi rolls for an entree, and I was also able to switch the dessert credit it comes with for the edamame appetizer. Just like last year, the sushi was delicious! There are a few vegan options in Sunshine Seasons that are even labeled as vegan (hooray! ), but I haven’t tried most since they aren’t gluten free–one day I did get a coconut yogurt with fruit cup which was labeled as “vegan dessert” though as well as Sweet Chili Tortilla Chips. I found these vegan labeled Disney chips at another store in Epcot too as well as in the shop near our hotel room at Caribbean Beach, and I tried both the Sweet Chili and Sweet Potato chip flavors (I preferred the Sweet Chili). One of the days I was at Epcot, I went to the Pineapple Promenade stand twice in one day–once to get a pineapple soft serve (which is basically a Dole whip) and once to try the violet lemonade–both were so yummy and refreshing! The Berry Basket at Showcase Plaza has a Field Green Salad with strawberries, crisp quinoa, strawberry vinaigrette, pecans, and tofu cheese. According to Vegan Disney World, there have been conflicting reports on whether the pecans contain egg whites, so order without them. 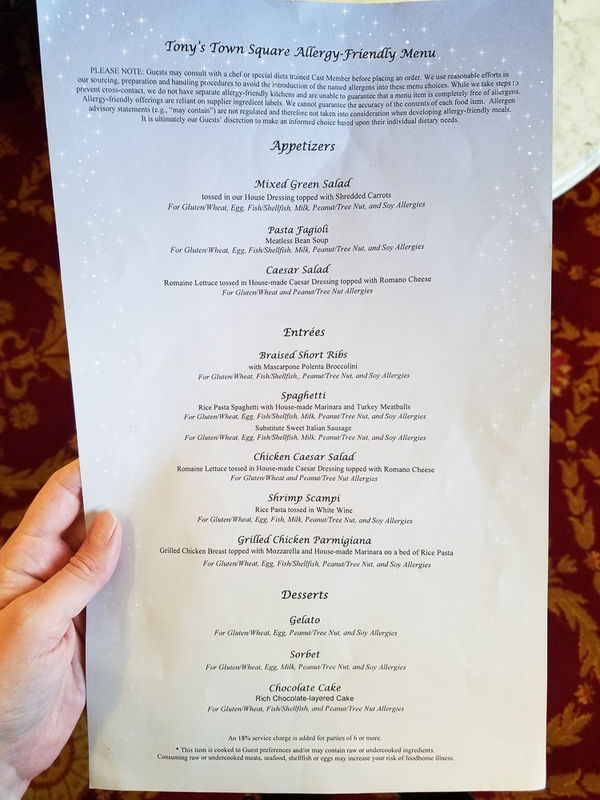 While I was there I ordered the salad as is and asked the cast members working if it was vegan, and they said it was but they couldn’t claim it as vegan on the menu because of potential cross contamination…so I’m hoping it was, but I would order without them in the future just in case. We decided to eat at Tony’s Town Square one day at Magic Kingdom because we wanted Italian, and I knew they had gluten free and vegan options (a lot of pizza/Italian places at Disney have vegan options or gluten free options but not both together). I ordered the same thing as last year, the pasta fagioli meatless bean soup and rice pasta spaghetti with marinara (no turkey meatballs) from the allergy menu. 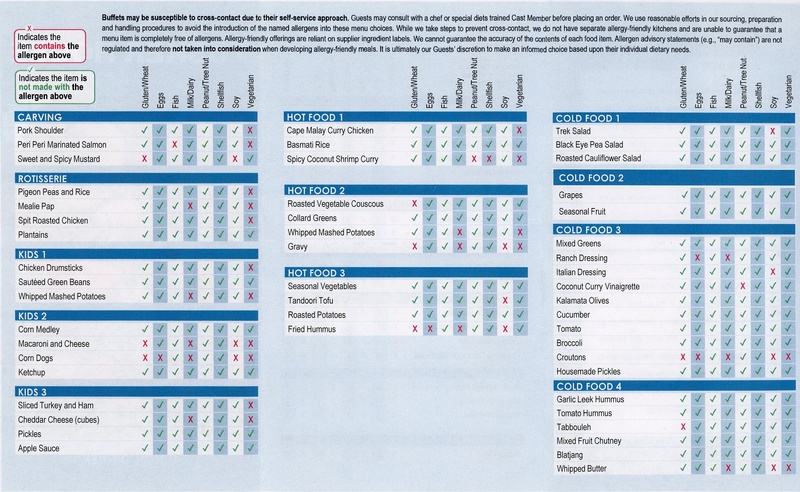 One of my goals this year was to try more quick service meals–I was nervous that it would be harder than at sit-downs, but I had positive experiences and ordering was fairly easy since I’d looked up options before the trip. At Pecos Bill I got the Veggie Rice Bowl but asked them to make it vegan (which means they substitute plain rice for the yellow rice), and I saw that the cast member who took my order hit a VEGAN button on my order-woo! I’m glad ordering vegan is becoming more common. The veggie bowl comes with white rice, black beans, and roasted zucchini and squash, and I ordered guacamole as well and then added pico, salsa, lettuce, and tomato slices at the toppings bar. It was pretty basic but quick and a nice healthy meal. I also had my favorite thing while at Magic Kingdom of course–Dole Whips! This year I got a regular one as well as this float version which was so delicious! One of my all time favorite Disney restaurants since I was a kid is the Sci-Fi Dine-In Theater–I love the setup and theme of the drive-in theater with cars as tables and clips of old sci-fi/horror movies playing in the background. The Sci-Fi Dine-In menu/allergy menu doesn’t have anything vegan as is, but for vegan and gluten free options the chef offered me a tofu dish, pasta, or falafel as well as a vegan milkshake (chocolate or vanilla.) I opted for the tofu dish, which had crispy tofu over white rice with stir fried veggies and a really good sauce–it was all delicious and one of my favorite Disney meals, especially since I got a vegan chocolate milkshake too! The 7-Layer Rice Bowl at Fairfax Fare was one of my favorite quick service meals this trip–the vegan chili is no longer on the menu but is still available (I already knew that from reading Vegan Disney World), so I requested it when ordering and the cast member told the manager, who knew immediately how to make it vegan for me with vegan chili and plain rice, hold the cheese and sour cream. So that made a five layer bowl with vegan chili, white rice, peppers, pico, and roasted corn, but they gave me a free side of black beans as well, and I also ordered guacamole…so mine ended up being 7 layers after all. It was very quick and filling and tasty as well. Since I’m gluten free as well that limited my options more, but I was still able to enjoy the trek salad, black eyed pea salad, roasted cauliflower salad, basmati rice, collard greens, roasted vegetables, tandoori tofu, roasted potatoes, plantains, corn, green beans, and hummus and cold veggies. There weren’t any vegan and gluten free desserts at the buffet, but the chef brought me out Enjoy Life cookies and berries. It’s so cool to see more tofu options at Disney World including this tofu bowl from Satu’li Canteen in the new Pandora section of Animal Kingdom–it had just opened last time I went but I didn’t get a chance to try it then. I ordered it with red and sweet potato hash and charred onion chimichurri (the only vegan sauce) with no boba balls. Check out this post to see all of the vegan options you can get there. 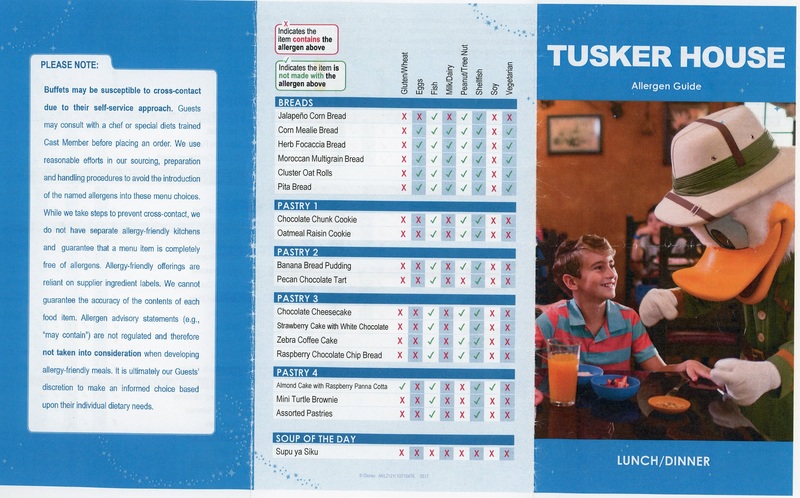 I also checked this allergy guide before I went, and also told the cast member who took my order that I’m vegan. I’d been wanting to try these fries ever since I saw them on Instagram, and they were delicious! They’re seasoned fries with sriracha ketchup (I love sriracha! )–just remember to order them without tzatziki to make them vegan. One of the things I look forward to most at Disney World is Erin McKenna’s all vegan and gluten free bakery, no joke. Even though the selection was picked over because I went in the evening over spring break, I was still tempted to try one of everything. I ordered a lemon tea cake, vanilla donut, cookie cupcake, and a bagel and biscuit (not pictured.) The lemon cake was melt in your mouth soft, and the cupcake and donut were both rich and amazing as well. I wasn’t as impressed with the bagel/biscuit–they were both pretty dry. I think they may have been better toasted and with vegan cream cheese, but I didn’t have a way to warm/toast them or have access to any condiments. Since we were staying at the Caribbean Beach Resort which was under construction, I thought I wouldn’t be able to eat at the resort, but they did have a temporary buffet (that counted as a quick service meal) set up that had some vegan and gluten free options! For breakfast the chefs made me vegan and gluten free Mickey waffles, and there was also oatmeal (made with water) and fruit at the buffet. One of the chefs was especially nice and brought me some extra nuts and dried fruit, an orange, and some soy milk for my coffee, and asked if I wanted some cupcakes as well, but I already had plenty to eat! It’s always such a great feeling when chefs go out of their way like that, and it made my day. They also had vegan Smart Balance out at the buffet for waffles/baked potatoes/whatever. 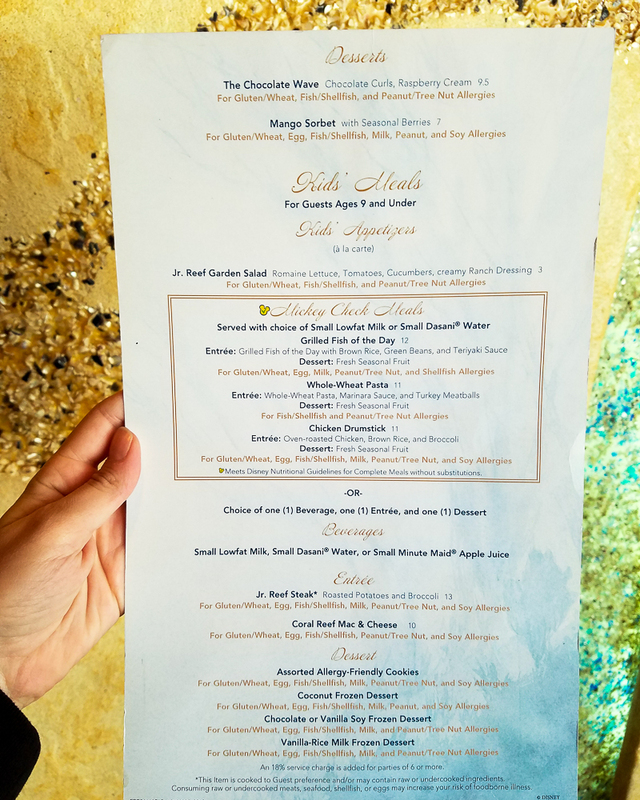 We tried the character breakfast at ‘Ohanas one day, and like the princess breakfast, it was a lot of fun, and I was happy with my options. When the server brought out Pineapple-Coconut Breakfast Bread for everyone else, they brought me a vegan/gluten free donut, and then for my hot plates the chefs made me vegan/gluten free Mickey/Stitch waffles and a tofu, potatoes, and veggies stir fry, and I had soy milk with my coffee. Our service was great and they brought me out a second plate of waffles as well. Sadly I had a terrible dining experience at the Hoop-De-Doo Revue, which was a bummer since it was one of my favorite meals at Disney during my last trip. Last year Chef T.J. was working the night I went and made me an amazing meal with vegan and gluten free bread, a custom salad, bbq potatoes, and a huge plate of grilled vegetables with rice. This time Chef T.J. wasn’t working, and the chef who was working seemed annoyed when he came to our table–he quickly showed me the allergy menu and said my only two options were the roasted vegetables or pasta. The way he said it made it seem like neither option was great, but I picked the vegetables since I had it last year and enjoyed it. Unlike last year, they didn’t bring me out bread, salad or potatoes–all they served me was grilled vegetables (not even potatoes or hearty vegetables, just zucchini, spinach, one mushroom, and one tomato slice), and it didn’t include rice like last year, so my “all you can eat” $70 meal was a plate of vegetables, with the worst service I’ve ever had at Disney World. All parks at Disney World have a Starbucks with the usual options like soy lattes and the new Hazelnut Mocha Coconutmilk Macchiato as well as some vegan snacks (see this post for details) like popcorn. If you’re visiting Disney World as a vegan, I recommend looking in to your options ahead of time by checking out Vegan Disney World’s blog and Instagram as well as Vegan Disney Food and Vegan Malory. 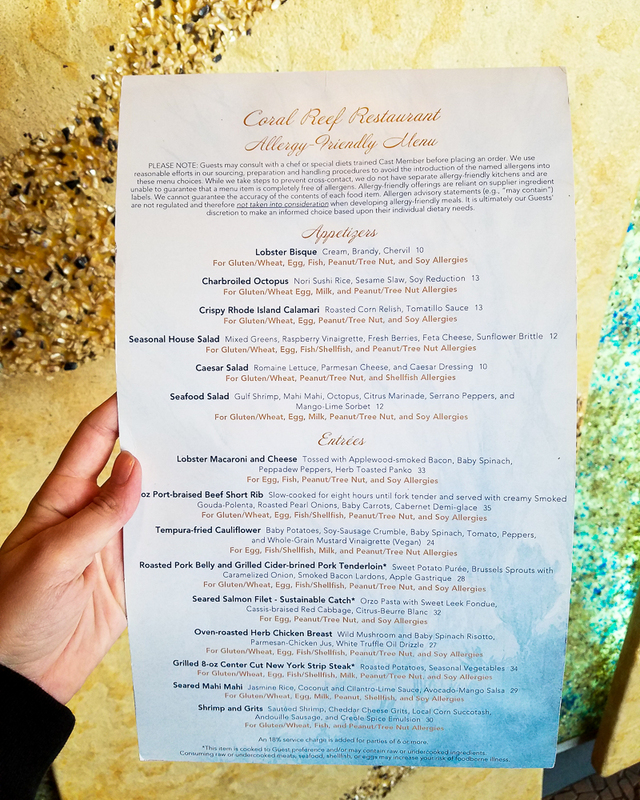 If you’re gluten free as well, check out Gluten Free Dairy Free WDW and/or google the allergy menu for the restaurant you’re interested in. When making dining reservations, note that you have food allergies (I check off dairy, eggs, and other since they don’t have a vegan option as well as gluten since I’m gluten free), and then tell the hostess and/or your server that you’re vegan/have allergies, and a chef will come speak with you. If you’re eating at a quick service restaurant, you can ask to see an allergy binder and/or ask to speak with a chef as well. Some of my favorite vegan and gluten free eats/meal experiences from this trip were the princess character breakfast at Akershus, vegan and gluten free Mickey waffles from ‘Ohana and Caribbean Beach, the tofu dish and vegan milkshake from the Sci-Fi Dine-In Theatre, Blaze Pizza and desserts from Erin McKenna’s at Disney Springs, sriracha fries from Mr. Kamal’s and of course Dole Whips! The quick service meal at the parks that I thought was the best value was the 7-Layer Rice Bowl at Fairfax Fare. I really enjoyed all of my other meals as well, with the exception of the Hoop-De-Doo Revue. Other than that experience, all of the chefs were very accommodating, and I had a pretty easy time finding tasty vegan and gluten free options in the parks. Have you been to Disney World as a vegan? What were some of your favorite foods? Let me know in the comments! Wow so many options!! I recently went to Euro Disney in Paris and there wasn’t even non dairy milk for coffee and tea! Oh no–that’s so disappointing! Yea there are lots of options in Disney World Orlando! Your website is so helpful to me! I’ve had no problem finding vegan options as I’m planning our trip to Disney, but my boyfriend recently is trying out a gluten-free diet and I had no idea where to find info on vegan AND gf. You’ve been such a big help – thank you! Yay, you’re welcome–I’m so glad it’s been helpful for you! Have fun on your Disney trip!